Best 21 Bangla Islamic SMS Collection. Who love to send Islamic SMS to their friend, here are 21 Bangla Islamic SMS for them. Sometimes we need SMS to send our friends or relatives in order to show greeting or something as a message. SMS is the shortest version of delivering a message to someone but in the sweetest manner. By the way, if you need some Islamic or an Islamic SMS to send your friend to be aware and be conscious about his prayer, then you can choose from these best 21 Bangla Islamic SMS collection which are given below. We have collected these Bangla Islamic SMS from the internet. Then we have selected the best SMS and reject the worst. 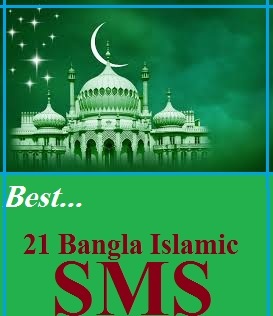 Thus we have presented you best 21 Bangla Islamic SMS collection or Bangla SMS collection. So, read these SMS Bangla Islamic SMS and use as your wish. 3. " JibonTa Jodi Sundor korte Caw ! Tahole 6 Ta Kaj Koro : 1=Namaz Poro,2=Quran poro,3=Hadis Poro,4=islamer Dawat Daw,5=Mittha Kotha BoLona,6=Sot kajer ades daw. 5. QuraN k TeLowAt Kro! IsLaM k Bissash Koro! MoHaMmaD (SM) k valo'BAsHo! 5waK2 NaMaJ Pro! jIBoNtA k SuNdor Kro! JoDi vaLo LAge sms Ta Share Koro!! 7. "Feel=Eman" "Give=Jakat" "Keep=Namaz" "Love=Mohammad(s)" "Read=Quran" "Talk=Hadis" "Work=Dawat" "Go to=Jannat"
8. He ALLAH,Tmar sunil akash teke aktu alo dao.ami ondokare alor poros pai.tomar fuler bagan theke aktu Hasi dao,ami sob betha vule jete chai. 9. hozrat ali(R) hote borni2: Duniyar sobcheye kothin kaj hochce nijeke songsodon kora. R sobcheye sohoj kaj hochce onner somalochona kora. 11. Banglalink:din bodoler cestai namaz porun. Robi:Jege uthun azaner dhonite. GP:kace thakun moszider Airtel:Namaj cara life impossible. 12. Ful k Valobaso pabe sudu gran.Islam k Valobaso pabe somman.Rasul k Valobaso hobe adorsoban.Allah k Valobaso pabe dujahan. 13. Akti lok, Bollo"Subahanallah"tar por Bollo"Alhamdulillah"tar por Bollo"ALLAHu akbar"se peye gelo 210 neki.R sei lokti holo tumi!! 14. Allah amay jagie dio fozor jokhon hobe. fozoreri azan sune utbo jege tobe. fozoreri namaz hoy jeno diner prothm kaj. Emon vaggo dao go Allah dao amake aj. 15. 1Din Sada Kafon Pore,Jete Hobe Ondhokar Kobore.2mr Sob Kicu Pore Robe Duniyate.1tu Vabo Moron Kale 2mr Sathe Ki Jabe?Plz Allah k voy koro? 16. Allah bolen, tumi oi din k voy koro j din tumar mukhe tala lagiye deoa hobe & tumar hat-pa tumar kritokormer sakkhi dibe. 17. Priyo grahok proti 5wakto NAMAZe apni pacchen 5bar beyam,5bar pobitrota,5bar allahor sakkat korar suborno sujug "jole uthun Allahor rohmote"
18. Hello Noy,Bolun Assalamualaikum.OK Noy,Bolun Insaallah.Owao Noy,Bolun Subhanallah. Great Noy,Bolun Masallah.Thanks Noy,Bolun Jazakallah! 20. "Feel=Eman" "Give=Jakat" "Keep=Namaz" "Love=Mohammad(s)" "Read=Quran" "Talk=Hadis" "Work=Dawat" "Go to=Jannat"
21. Jara porena NAMAZ, Tara Nosto Kore Somaj. Jodi Boli Vai NAMAZ Poren 5 wakto, Tara ble Via sorry Kapor-Chopor Sob Nosto!! NAMAZ Pora Ki Atoi kosto? From Bangla Books PDF, We hope that you've greatly enjoyed these best 21 Bangla Islamic SMS collection reading are presented in this page. If you enjoy this collection, please share it with your social networked friends.